It’s time to sort the Christmas party! The Yellow Boats are on hand to make sure this year’s group gathering is one friends, visitors and colleagues will never forget, with the perfect festive celebration tour packages. 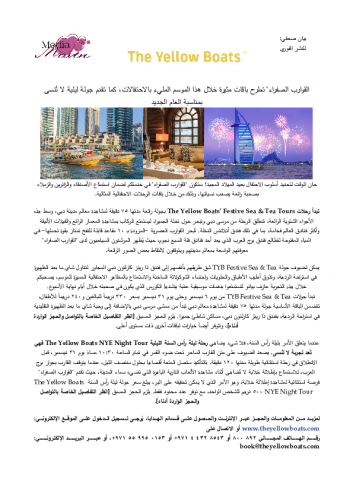 The Yellow Boats’ Festive Sea & Tea Tours start with a spectacular 75-minute tour of Dubai. Revelling in these glorious winter temperatures, the trip sets off from Dubai Marina and cruises around Palm Jumeirah, taking in the incredible architecture, luxurious villas and the world’s most iconic hotels, including Atlantis The Palm. The state-of-the-art 10-seater rigid inflatable crafts then hit the open water, circling the seven-star Burj Al Arab, as The Yellow Boats’ skippers offer insider knowledge on their city and stop for beautiful photo opportunities. TYB Festive Sea & Tea Tour guests can then make their way to the neighbouring Ritz-Carlton Dubai hotel to enjoy Afternoon Tea at the Lobby Lounge, to fill up on sweet and savoury treats, sip hot cocoa and enjoy the joys of the season. A live pianist accompanies the experience, joined by an angelic choir at weekends. The TYB Festive Sea & Tea Tours runs from December 6th to 31st and cost AED 330 for adults or AED 240 for children. The standard package includes a 75-minute tour of Dubai, departing from Dubai Marina Walk plus Traditional Treat Afternoon Tea at The Lobby Lounge, Ritz-Carlton Dubai, Jumeirah Beach Residence. Pre- booking is essential [see contact and booking details below], and upgraded package options are available. And when it comes to New Year’s Eve, nothing can be quite as memorable as The Yellow Boats NYE Night Tour. Guests board their magical boat by moonlight at 10.30pm on December 31st, before heading out for an exclusive, extended 120-minute trip. The excitement will of course reach its peak at midnight, when the boat will stop next to the Burj Al Arab, for an unrivalled view of the city’s world-class fireworks overhead. Offering a unique vista, that simply cannot be captured from land, The Yellow Boats NYE Night Tour costs AED 500 per person, with limited availability. Advance bookings are essential [see contact and booking details below]. 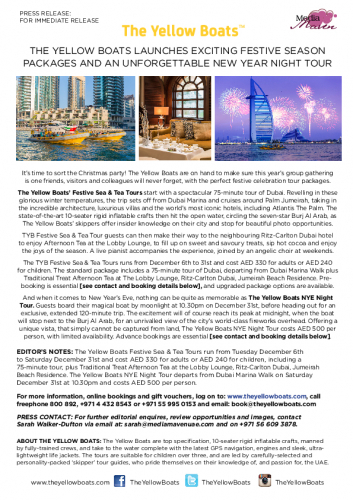 EDITOR’S NOTES: The Yellow Boats Festive Sea & Tea Tours run from Tuesday December 6th to Saturday December 31st and cost AED 330 for adults or AED 240 for children, including a 75-minute tour, plus Traditional Treat Afternoon Tea at the Lobby Lounge, Ritz-Carlton Dubai, Jumeirah Beach Residence. The Yellow Boats NYE Night Tour departs from Dubai Marina Walk on Saturday December 31st at 10.30pm and costs AED 500 per person. PRESS CONTACT: For further editorial enquires, review opportunities and images, contact Sarah Walker-Dufton via email at: sarah@mediamavenuae.com and on +971 56 609 3878. ABOUT THE YELLOW BOATS: The Yellow Boats are top specification, 10-seater rigid inflatable crafts, manned by fully-trained crews, and take to the water complete with the latest GPS navigation, engines and sleek, ultra- lightweight life jackets. The tours are suitable for children over three, and are led by carefully-selected and personality-packed ‘skipper’ tour guides, who pride themselves on their knowledge of, and passion for, the UAE.